You are Jonathan Bro, indie action film badass and total bro. The year is 1999. The people of Poopwater, NM have called upon you to destroy the feco-electric dam which has ruined the town. I hope it features mechanics from both Braid and The Witness! Currently painting up a basic 256x256 tiling floor texture. Since I'm going for a doomy feel, I'm trying to keep graphics to what was possible in 1993. Textures < 256px, limit palette, very simplistic lighting model (basically one light level per sector, applied uniformly). This will be interesting because Unity 3d defaults are much nicer than what I'm trying to do. Got hung up on on adding walls for awhile. First time, screwed up because I somehow set my room object (which contains the walls) to a weird scale, which made doing the placement math very strange. Also, used Quads instead of Cubes for walls which became a problem because the player moves so fast he would pass straight through a Quad (which has zero depth). Blew up my original room, rebuilt in standard Unity scale, and made the walls from Cubes. Much better! Got the basics of a game down. Tomorrow, adding doors, bad dudes, combat, and start embroening. Movement feels like Doom, which is rad. I'm bad at pixel art & textures, but I finally feel like I hit "patient amateur with no natural ability" level. - Spending more time getting the "base color" right. - For me, pixel art can't be made by placing pixel-by-pixel. I have to think of it like I learned to do charcoal and pastels: start with vague areas of light and dark, then refine bit by bit until you have the desired shape. - After you block out rough color regions: stop using 100% opacity for anything. Purists who want you to blend color by hand seem like they are doing that for the challenge/sport, not because it is the best way to make assets. - Loosen up. 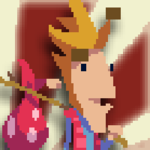 I always want to zoom in and hand place every pixel, but the result is something that looks super fake-- too geometric. It is OK to have the pencil slip a pixel or too sometimes. Very few perfect lines in nature. - Use lots of layers. The "only one layer" crowd, again, seems like sport hunters. Layers give you freedom to make mistakes and let you mask off areas to focus on. - Use noise layers and blend them down onto lower layers. This looks better than perfect patches of color. - Added pixely Big Dogs. They look pretty bad, but whatev. The Big Dogs animate, and have facings, and FOLLOW YOU. The Big Dogs can be shot. - Listened to a lot more musical options. - Big Dogs fight back. - Make the waves of Big Dogs stop at some point! Hahaha, that video is amazing. This is looking good so far! I had a tire blow out on my car which took of most of my dev time this evening, between putting the spare on and then waiting at the shop to get a new one on. Trying to game jam and also do a full day of day job is hard. I did manage to make the waves of Big Dogs stop. There's a spawn manager now that controls how many portals, how many waves, how far apart they are spaced, etc. Hoping to catch up some tomorrow and finally, actually work on sound. Haha, that's absolutely fantastic but maybe a bit unbalanced. Yeah, I might have to turn down the spawn rate a little bit. I saw your gifs on the Twitter, and man, nice doom clone. Starting from there, I wanted to introduce the key limitations of that engine as creative constraints on myself. Purely vertical walls and floors. No vertical stacking (I have no different height sectors at all right now just because I have not gotten to it). Enemies and power ups as scaled sprites. Enemies with 8 facings, only a few animation modes, and animations of 2-4 frames. Very simple lighting (mostly room level lighting). Low resolution tiled textures. From those limitations comes a lot of the clone feel I am trying to capture. Also, I figured out the Doom guy's movement speed and converted it from Doom's unit system to Unity's. I ended up fudging a little bit, but it is in the ballpark. And yes, you move faster if you are running diagonally. - Room doors animate open and closed. - Built spawn portals that spawn out waves of Big Dogs. - Tied the spawns to room scripts-- you enter a room, the doors close, and waves of Big Dogs spawn. When you kill all the waves, the portal goes away and the doors open. - BEE SOUNDS (I cheated on the constraints a little, and used 3D audio, because I find it helps to know if you are being flanked). - Finally, there are multiple rooms (all the same room type right now). I am working around it for now by only having one room with active AI at a time, and a NavMesh that is a very large flat plane. The rooms are very simple and all the same. Since you don't see the crazy stuff the AI in other rooms are doing, this bit of stagecraft works. The AI follows you, and there are no obstacles to avoid within the rooms right now, so it works. - Different types of rooms (varying difficulty rooms, treasures, OTHER ROOMS). - Power up drops (health, rapid fire, spread shot, bombs). - Particle explosions when you shot hits something (added because the lack of feedback made you feel like you missed when you actually hit). - There is a win condition now. The power ups take inspiration from Smash TV (as do some of the mechanics of the arena battles within each room). They give you a special weapon for a limited duration and drop from enemies some % of the time. - One attack animation is weirdly floaty, so I need to tweak it maybe. If I pick up the game later and work on it more, I would like to add variety to the room shapes and contents. Everything happens on a 2d plane with walls meeting at 90 degree angles, which actually makes the levels more Wolfenstein than Doom. I want different areas, hazardous pits, steps, windows, etc. It would be good if there were variety of enemy types too. I wanted a type of enemy that shoots projectiles to break up the combat routine and force the player to dodge more. I just could not fit it in. I wonder if the game would benefit from an ammo management mechanic or weapon charge meter-- because right now the best strategy is just to spam shots as fast a possible and I wonder if it would feel better if you were encouraged to line up your shots. I wanted to add some quips for the enemies and PC. It isn't part of the genre formula, but I could've done some good stuff with the theme. I had a couple exchanges roughed out, but would've needed a lot more to justify the system. I couldn't fit it in because it takes me a long time to work through good creative writing. Ok, so the mouse sensitivity was a LITTLE HIGH. I turned it down slightly (76% or so) and made a slider under SETTINGS. The moment you get the tri-shot is really cool. This really captures that early Id Software feel and tone well - love the music and the avatar especially! Good to have an EOGB, though I probably could have done with a bit less of the Wolfenstein-style box maze to get there! All the stuff you suggest for future additions are exactly what I'd like to see! Very great doom clone, captures doom clone holistically. Interesting the mechanic the poop creates, more deadly than the robots full of bees.